The recent reawakening of the debate about migration in the new millennium has evoked intense emotion, particularly in the United States and Europe, and Global Crossings cuts through the jungle of myth, falsehood, and misrepresentation that dominates the debate, clarifying the causes and consequences of human migration. The book first looks at the immigrant experience, which connects the present to the past, and America to the rest of the world, and explores who immigrants are and why they move. It contends that the conduct of today is no different than that in the past, and contrary to the claims by immigration critics, the patterns of contemporary migration do not differ fundamentally from those of other epochs. 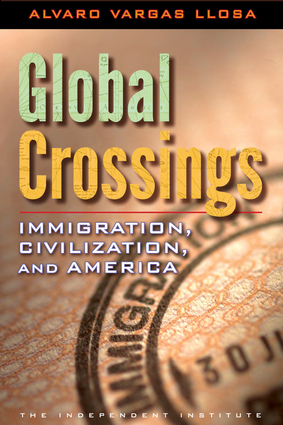 The book then discusses immigration and culture and tackles assimilation, globalization, and cultural differences. In assessing whether critics are justified in pointing to a major cultural shift, award-winning author Alvaro Vargas Llosa reviews such topics as religion, education, entrepreneurial spirit, and attitudes toward the receiving society, and analyzes economic factors that include jobs, wages, education, and the welfare state. The book concludes that immigration’s contributions to an economy far outweigh the costs, and it makes a call for open minds and provides a pro-immigration agenda for reform. Alvaro Vargas Llosa is a senior fellow of the Center on Global Prosperity at the Independent Institute; a lecturer on world economic and political issues at such venues as the World Economic Forum, the U.S. Chamber of Commerce, the Council on Foreign Affairs, and the Inter-American Dialogue; and has contributed to the BBC World Service, the Los Angeles Times, the Miami Herald, the New York Times, Time magazine, the Wall Street Journal, and the Washington Post. Among his books are The Che Guevara Myth, the award-winning Liberty for Latin America, and The Madness of Things Peruvian. He lives in Washington, DC.